Iconic Labs is a newly founded, California company dedicated to delivering premium beauty products directly to the consumer, cutting out the pricey middleman. * Modern beauty should combine advanced science with the benefits of natural, indigenous botanicals. * Modern Beauty should be accessible and affordable for all. Based out of LA and San Francisco, Iconic products offers high quality, cutting edge formulations to their consumer, at affordable prices via the ingenuity of the Silicon Valley. The seasoned and committed beauty industry experts who founded the brand, joined forces with the best and brightest tech people to create a truly unique online platform for their product lines. Launched in late 2008, OOKISA products are infused with Folliactiv™, a complex of scientifically-advanced vitamins, botanicals and amino acids proven to revive follicles and promote an optimum environment for thicker, fuller looking hair. The line is also infused with Hana-Senzai Energy Blend, a mélange of Eastern botanicals that includes: White Peony Tea, Japanese Citrus, Camellia Oil, Rooibos Red Tea, and Water Lily. Sold exclusively online at www.OOKISA.com, this haircaire line is paraben-free, colorant-free, hormone-free, sulfate-free and cruelty-free. 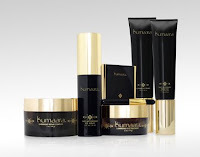 Kumaara, launching this month, is a new skincare system formulated with Linefactor®, a scientifically advanced growth factor protector, inflused with potent certified organic berry blend of Indian Gooseberry, Goji and Açaí antioxidant super-fruit extracts. Avail exclusively at www.Kumaara.com, Kumaara integrates a number cutting edge ingredients such as, Dermaxyl, a potent Oligopeptide that stimulates increased collagen and elastin production; Matrixyl 3000, a proven Tetrapeptide designed to lift and firm skin for effective wrinkle reduction; Oligogeline®, a red seaweed extract that forms a protective, moisturizing layer that encourages skin cell renewal; Actiflow®, a P0lysaccharides-rich compound that lightens under eye circles by reinforcing the skins capillary system; and EyeSeryl, a Tetrapeptide that enhances skin elasticity and smoothness while significantly reducing under eye puffiness in as few as 15 days. We have a surprise pack containing something from each line for our lucky winner this week! *Pop on over to either www.OOKISA.com or www.Kumaara.com and check out their products. Come on back and leave us a comment about why you would like to try their products. This contest ends Wednesday, May 27th at 11:59pm (pdst) so don't wait - make sure you've gotten all six entries before it's too late! Please note: entries received after the cutoff time will be deleted prior to drawing a winner. I would love to try their products because my hairs needs what their products provide which is daily maintenance purifying Hydration and Volumizing. I am a "Big Hair" gal from the 80's and these products sound as though they would work well for what my hair and style needs. I'd love to try the Instant Volumizing Souffle. I have such flat hair and I'm always trying to get it more voluminous! Thanks for the giveaway! Well, everytime I look in my magnifying mirror to put on my makeup I notice more and more...and more wrinkles around my eyes. YIKES!! Therefore, I'd like to try the eyecare line because I like that it's cutting edge, and I'm always looking for new products to try. Also, I live in the Bay Area/Silicon Valley so it's kind of cool that they were mentioned in your post. I have your widget and button my blog, Butterfly Whispers. The link is below under my email address. I'm a subscriber by email and Google Reader.